Beginning in the twentieth century, American faculty increasingly viewed themselves as professionals who were more than mere employees. This volume focuses on key developments in the long process by which the American professoriate achieved tenure, academic freedom, and a voice in university governance.Christian K. Anderson describes the formation of the original faculty senates. 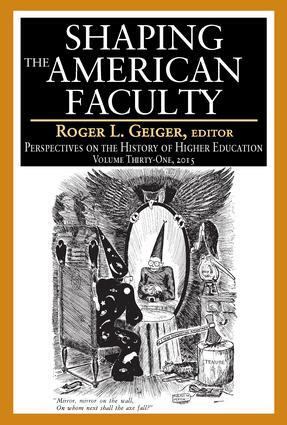 Zachary Haberler depicts the context of the founding and early activities of the American Association of University Professors. Richard F. Teichgraeber focuses on the ambiguity over promotion and tenure when James Conant became president of Harvard in 1933. In "Firing Larry Gara," Steve Taaffe relates how the chairman of the department of history and political science was abruptly fired at the behest of a powerful trustee. In the final chapter, Tom McCarthy provides an overview of the evolution of student affairs on campuses and indirectly illuminates an important negative feature of that evolution�the withdrawal of faculty from students' social and moral development.This volume examines twentieth-century efforts by American academics to establish themselves as an independent constituency in America's colleges and universities.